18 Free Alternatives to Connectify : – There is no introduction required to the most popular virtual internet sharing software, Connectify for the Windows PC. It not just allows you to share your internet connection effortlessly across several devices (smartphones, tablets etc.) by turning your computer to a WiFi router, but also offers many advanced features like, File Sharing, Dispatch and more. While Connectify is almost a household name in the category of wireless hotspot, new concepts like “Virtual WiFi Technology” by Windows 7 is already making their way through. This technology allows you to convert your Windows 7 or 8 /10 computer into a portable hotspot without the need of a third party hotspot application. It may not be an entirely smooth process to use this embedded WiFi, but has surely triggered a competition that compels other hotspot makers to come up with enhanced features. However, despite the fact that Connectify is the best WiFi hotspot software out there with some unparalleled features, it’s free “lite” version offering limited features and the steep pricing of the PRO and the MAX versions (starting at $35 and $50 respectively) compels many to look for alternatives. Moreover, the fact that Connectify is feature rich also makes the entire process a bit perplexing. So while, there is hardly any competition to it in terms of its features, there are many free alternatives to Connectify that are not only comparatively easier to use, but also works as an excellent option as a WiFi hotspot station. 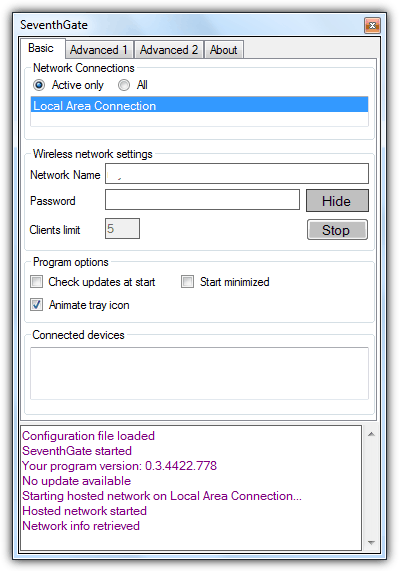 Convert your windows computer into a virtual WiFi router effortlessly with SeventhGate. It uses its virtual wireless mini port inside your computer to set up the hotspot making it very close to the virtual routers. It’s easy to use and an ad free tool like connectify which can be turned off when not in use to free up your resources. Earlier a paid software, 160 WiFi is now available to download completely free of cost with the new name OSToto Hotspot. It offers a secure platform to create a virtual WiFI hotspot out of your computer in a matter of seconds. You can then share the internet with the connected portable devices, iOS or Android that also has the management features. Moreover, the software is ad-free which makes it a befitting alternative to Connectify. Compatibility: Windows XP, Windows Vista, Windows 7, Windows 8, Windows 8.1 and Windows 10; both 32 bit and 64 bit versions. 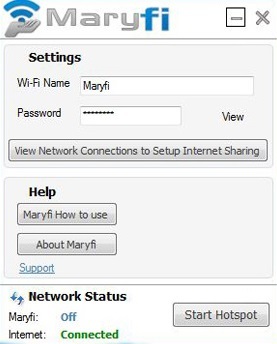 If your computer runs on Windows 7 then Maryfi can be the best free option for you, however, it all runs on other versions. It is an extremely easy to use and simple virtual router software that allows you to share any internet connection or even a WiFi network to PCS, tablets or even smartphones. The best part is that it helps share the WiFi connection that your computer is linked to, while the access point is secured with a password that has WPA2 encryption for enhanced safety. Turn your Laptop/Computer into a WiFi wireless access point instantly with MyPublicWiFi and share internet with your nearest devices conveniently. Not just for personal use, this software is also useful for creating temporary wireless network setup that’s separate from local area network and is used by conference rooms, hotel rooms and more. That’s not all as you can also keep a track of and keep a record of all URL pages that have been visited using MyPublicWiFi. Got a Windows PC and an internet connection? Winhotspot or WindowsHotspot can turn your PC into a WIFi hotspot in no time at any given place and at any given point of time. It comes with a built-in bandwidth meter that keeps a track on the internet usage. You can also see the client P and the MAC addresses of the connected devices under separate tabs displayed under the hotspot platform. If you are looking for a freeware then one of the names that cross one’s mind instantly is mHotspot. It can turn your computer into a wireless hotspot software within minutes which you can use to share your computer’s internet with other devices. One of the unique features of mHotspot is that enables your laptop to work as a repeater which means that the laptop can extend the WiFi network range by creating an additional WiFi network. The bonus is that it allows you to connect up to 10 gadgets and gives you access to in-app internet option. Additionally, you can also view the connected device details such as IP address, Mac address, Name and also allows you to keep a tab on the network usage and more. Create a home network by turning your PC or laptop into a WiFi router using Virtual Router Plus and connect your tablet, smartphone or another PC. It is an open source software which is extremely easy to use and requires no installation. You can just select a name and set a password for the connection to be created. Now start the Virtual Router Plus for instant access to WiFi network. You can share your internet connection with other devices using its Windows Wireless Hosted Network technology. Even though WiFi Hotspot Pro is a Microsoft app, it works only with Windows 10 currently. So, if you are downloading the app for the first time you have to first upgrade your windows version to windows 10. However, the upsides are that it is simple to use and it’s free. As per what it claims, you can set up a WiFi hotspot with this software in just three simple steps. Baidu Hotspot is one of the best free connectify alternatives available today. Baidu Hotspot service is not only easy to use, but also offers some advanced features completely free of cost. Moreover, you never face a lag using the software due to the advanced features. 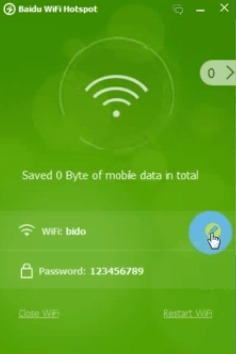 While it helps you to share the internet quickly across devices, it also allows the WiFi hotspot connected device to share files equally efficiently. Compatibility: Windows XP, Windows Vista, Windows 7, Windows 8, Windows 8.1 and Windows 10. Wi-Host is another free portables software that converts your Windows PC into a virtual WiFi hotspot in no time. You can share your internet conveniently with your devices thereafter. Being a portable software it does not require to be installed before you use it, however, you need to simply right click on the option that says “Run Administrator” in order for Wi-Host to run as an administrator. It’s a unique tool offered by AskVG hence you will actually find the download link in a blog post. Get a free internet manager software for your desktop with Virtual WiFi Router – My Router. So, leverage the virtual WiFi technology used by the Windows servers and streamlines the internet sharing process safely and quickly with other WiFi-enabled devices. Among its other features, it comes with WPA2 encryption that allows you set a password for security and you can also change the WiFi name when needed. The user-friendly interface allows you to access the WiFi router without a headache. So, not just as a home network, you can also use Virtual WiFi Router – My Router at schools, office, inside the car or wherever your laptop or PC is available. If you are looking for a viable alternative to Connectify, Open Garden can be one of your bets. It is a free internet application designed for Mac, Windows and Android that manages your internet network in a way so that other gadgets can also connect to your internet. It also allows you to share your mobile internet among all other gadgets. It does not require any root access, however, uses Bluetooth and WiFi direct. In order to use it you need to install Open Garden on your connected devices as well such as, on a tablet or smartphone. The best part is that it can also extend the existing networks range by connecting to several devices at a time. With My WiFi Router you can do exactly what you need it for, that is convert your computer into your WiFi hotspot station whether public or private. While you can share your internet connection using the software among all devices, you can also allow access or even blacklist users using the option “Connection Management”. Furthermore, you can share videos or even close the WiFi router automatically by setting the Timer. Moreover, the Software Conflict Detection is automatically turned on by My WiFi Router which we can deactivate or select the option that helps it shut down automatically under the settings. A simple and useful tool, Virtual Router – WiFi Hotspot is a great free alternative to Connectify. It is a windows program that was created by a Microsoft MVP for Bing Maps and Carto LLC Co-Founder named, Chris Pietschmann. This free software turns your windows PC into a virtual WiFi router in a matter of minutes. While you can share your internet network wirelessly across all devices, you can rest be assured that your connections are completely safe with the top-class wireless encryption, WPA2. Virtual Router – WiFi Hotspot offers an extremely user-friendly interface along with the facility for the router to work even without the internet network sharing. Ensure that you uninstall any previous version before you install the new version. Virtual Router Manager is a free and an open source software that enables you to develop wireless networks for your Windows PC or laptop. Using a wired network, mobile phone internet connection or WiFi in unison with a wireless stick or a card it creates a wireless network for you to access the shared internet connection on connected devices like iPhone, Android, Pad and more. The application takes up minimal space, is very easy to install and comes with no advertisements. In order to set up the Virtual Router Manager, you need to have the basic equipment ready that includes a wireless stick or a card. It also allows you to share mobile internet, ADSL, other WiFi network and modems. For additional protection, you can set up a password for your networks with WPA2 encryption. If you want to share your internet connection with other devices with no hassles, Virtual Router is just the right option for you. 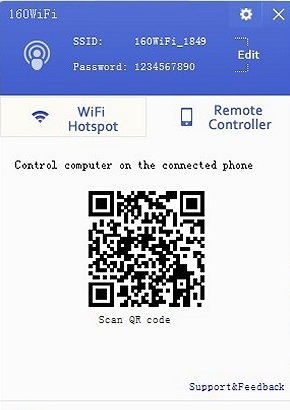 It works as a great alternative to Connectify considering it’s a straightforward and portable application with no complications that helps you to create hotspot on your PC or laptop super conveniently with no step by step instructions. Since it is a portable application, it does not even need to be installed. Also considering that the Virtual Router comes with default settings you only need to create a network name and password for the WiFi hotspot set up. Once you are done with the easy setup procedure you can then share your PC’s internet connection with all devices that are WiFi enabled. With WiFi Hotspot creator you can convert your PC immediately into WiFi router and share your internet connection with a unlimited number of devices. It’s a freeware and does exactly what you want; create a virtual WiFi router out of your computer in no time. The best part is that it’s free of malware, easy to set up and safe to use. It allows you to share your broadband connection securely whether through a mobile phone, Cable, DSL or a Dial-Up connection. The application comes in multiple languages, with network card support, advanced features and a good Email and Forum support. 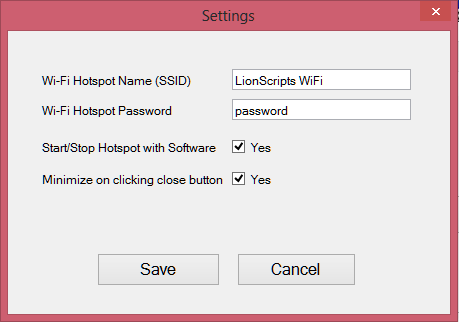 Adding to the list of simple internet sharing software, Lionscripts WiFi Hotspot comes in both Free and Paid versions. Even though you may have to tolerate the ads in the free version, it’s an easy to use platform and the fact that you can also start the software even without opening it up makes it an excellent free alternative to Connectify. The Pro version comes without ads. Compatibility: Windows XP, Windows Vista, Windows 7, Windows 8, and Windows 10. I use OSToto Hotspot. It is useful for me. The wifi could be workable after easy setup. Really love it. WIFI HOTSPOT CREATOR,,,,ADWARE!! asking to install CHROMATIC BROWSER WITHOUT AN OPTION ”NOT” TO INSTALL!! NO THANKS!!!! Thank you for your extensive list of free hotspot apps for Windows, I was longing to find a list like this. I picked mHotSpot and am liking it very much. I suggest you guys to install it. I love OSToto Hotspot beacause of the neat interface, easy-to-use and blacklist function. What’s more, I can set a time for the hotspot to turn off. Really convenient.